In deepest darkest Africa on the border between Central African Republic and the Democratic Republic of Congo lies a superb double waterfall. 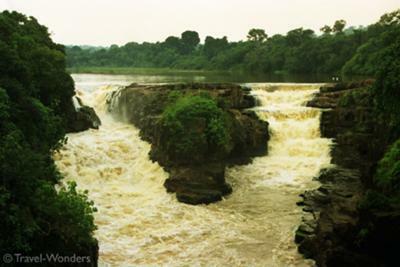 Next to the rustic village of Kembe with its mud-brick huts and thatched grass roofs, the falls of the same name roar for 24 hours per day breaking the peaceful silence of the rain forest and gently running Oubangui River. The village children play in the stream joyously riding the currents dangerously close to the tumbling cascades. Sadly, both countries have struggled with wars and a string of poor military governments and are difficult to safely visit. Meanwhile enjoy the somewhat aged (and scanned) photo of this beautiful location and waterfall.